Action Performance Companies Inc., the leader in the design, promotion, marketing and distribution of licensed motorsports merchandise, today announced the release of a special edition die-cast replica featuring NASCAR� favorite Dale Earnhardt Jr. and RCA recording artists Dave Matthews Band. Earnhardt Jr. will roll out the No. 8 Budweiser/Dave Matthews Band Chevrolet Monte Carlo for the 500-mile NASCAR NEXTEL Cup Series race at California Speedway on Sept. 5, 2004. The car will feature imagery familiar to Dave Matthews Band fans as well as the Budweiser True Music motif. A week after Dale Jr. debuts the race car at California Speedway, music fans will descend on San Francisco�s Polo Fields in Golden Gate Park for a benefit concert presented by Budweiser True Music with headliners Dave Matthews Band. The event will support select Bay Area community charities that work for the homeless, pediatric AIDS and other terminal childhood illnesses, Bay Area park improvement and music education. General admission to the sold out event was free; however, fans who requested tickets were asked to make a cash donation to the Bay Area Charities. Action Performance Companies, the exclusive die-cast licensee for Dale Earnhardt Jr.�s stock cars, will produce replica versions of the No. 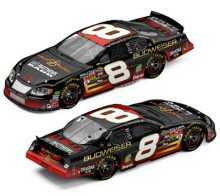 8 Budweiser/Dave Matthews Band 2004 Chevrolet Monte Carlo in both 1:24- and 1:64-scales. The car can be ordered via Action�s standard distribution channels. To reach one of 16 Action Racing Collectables distributors, call the locator line at 1-800-411-8404. Racing Collectables Club of America, the source for Action�s Elite� die-cast series, can be reached at 1-800-952-0708 or visit RCCA online at www.goracing.com. "While modern rock favorites Dave Matthews Band may not be the conventional choice to appear on the No. 8 Budweiser Chevrolet, the fact that such a big-name group is participating in the NASCAR experience shows just how mainstream the sport has become," said Fred W. Wagenhals, Action Performance�s chairman, president and CEO. "Dale Earnhardt Jr.�s diverse music taste is well known, and I think he welcomes the opportunity to expand his fans� musical horizons with a special Budweiser True Music imprint." Bama Works Foundation was established by the Dave Matthews Band to carry out the band�s commitment to charitable works, both close to home and worldwide. From the Amazon Rain Forest to community parks, Bama Works has given to numerous non-profit organizations, community programs and charities. Dave Matthews Band also has performed at a number of benefit concerts. For more information, visit www.davematthewsband.com.